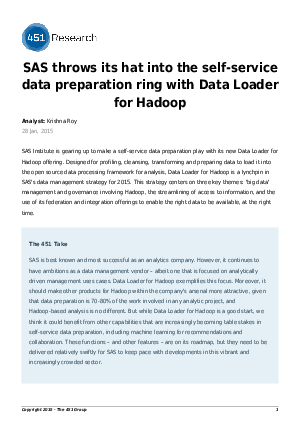 SAS Institute is gearing up to make a self-service data preparation play with its new Data Loader for Hadoop offering. Designed for profiling, cleansing, transforming and preparing data to load it into the open source data processing framework for analysis, Data Loader for Hadoop is a lynchpin in SAS's data management strategy for 2015. This strategy centers on three key themes: 'big data' management and governance involving Hadoop, the streamlining of access to information, and the use of its federation and integration offerings to enable the right data to be available, at the right time.